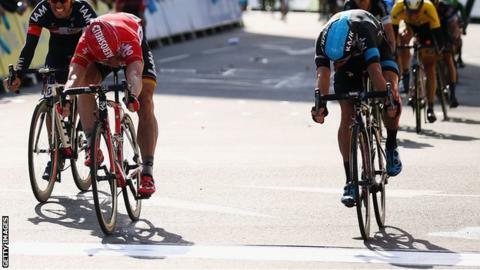 Germany's Andre Greipel won a thrilling sprint finish in Saturday's penultimate stage of the Tour of Britain. The 33-year-old Lotto-Soudal rider was millimetres ahead of Team Sky's Elia Viviani, 26, as the two crossed the finish line together. Stage seven of the Tour covered 139 miles between Fakenham in Norfolk and Ipswich in Suffolk. "We really wanted to go for the sprint today. It was hard work, so hats off to my team-mates," said Greipel. Norwegian MTN-Qhubeka rider Edvald Boasson Hagen finished fifth to retain his overall lead. He goes into Sunday's final stage, which is expected to end with a sprint finish in London, with a 13-second lead over the second-placed rider, Sky's Wouter Poels. Boasson Hagen, 28, would become the first rider to win the Tour of Britain twice since its return to the professional cycling calendar in 2004. Britain's Owain Doull, riding for Team Wiggins, came sixth in the stage and remains fourth overall, 44 seconds behind the leader.